Samphire, aka Salicornia europaea is a type of sea vegetable more commonly known as “sea beans”, “beach asparagus” or “glasswort”. It has a crunchy texture and a briny, slightly salty taste. I first had them several years ago at Craft, Tom Colicchio‘s (of Top Chef fame) restaurant in Gramercy Park, here in New York City. As I recall, it was served as an amuse-bouche — simply sautéed in unsalted butter or perhaps a touch of olive oil. I instantly fell in love with its assertiveness which needed little in the way of enhancement. Then as now, the best thing that one can do with samphire in my opinion, is to cook it simply with very little adornment so that its brash flavor sings out loud and clear. Here, it appears in a version of that classic Italian-American dish, spaghetti with white clam sauce. It’s a new twist on an old favorite, one that you’ve never had before. Wash clams well, scrubbing if necessary to remove external grit. Place clams in a heavy-bottomed pot. Add garlic and garlic chives. Pour in white wine. Steam, shaking pot occasionally, until most of the clams are open, 7 to 10 minutes. Use a slotted spoon to remove clams to a broad bowl; reserve cooking liquid. When clams are cool enough to handle, shuck them over the bowl, catching every drop of their liquid; discard shells. Discard any clams that do not open. Chop the clams finely, then set aside. Prepare pasta according to package directions; cook until al dente. Drain pasta when done, reserving 1/4 cup cooking water. Warm olive oil in a large skillet over medium heat. Add shallots. Add clams and reserved clam juices to the pan. Cook until clams are heated through. Taste for salt and pepper. Whisk in 1/2 tablespoon unsalted butter, cut into bits. Let sauce reduce slightly, about 1 minute, whisking frequently. Sauce should be slightly thickened, enough to coat the back of a spoon. Stir in samphire; stir occasionally. 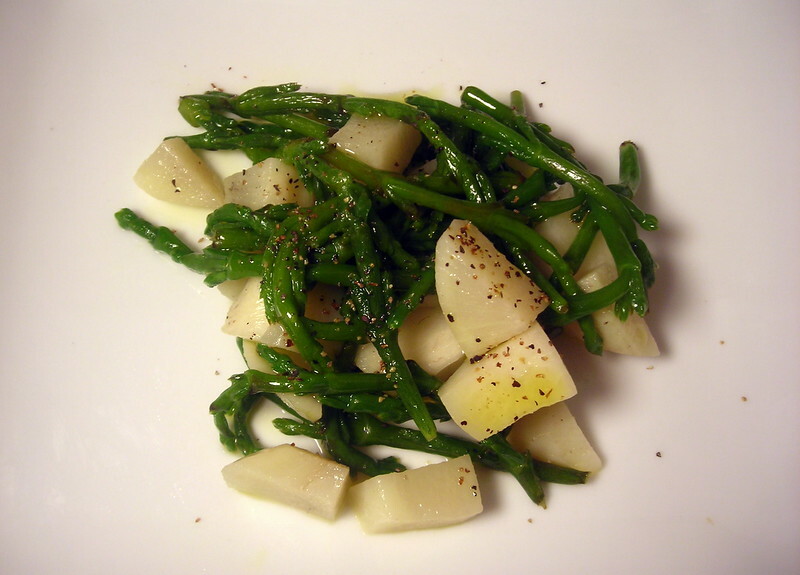 Cook until the samphire becomes a bright emerald green, about 1 minute. Add pasta to the skillet. Toss. Sprinkle with fried breadcrumbs, then serve at once. (1) — Bottarga is dried mullet roe. Available at specialty food shops or online. Gently warm oil in a small skillet over medium heat. Add the breadcrumbs. Stir in bottarga, if using. Sauté until the crumbs are crisp and golden. Taste for salt and pepper. Mix well. Store in the refrigerator in a tightly covered container; keeps for up to one week. This is my contribution to Presto Pasta Nights #258, a weekly food blog event currently hosted and organized by Ruth of Once Upon a Feast. 02 Apr	This entry was published on April 2, 2012 at 6:50 pm. 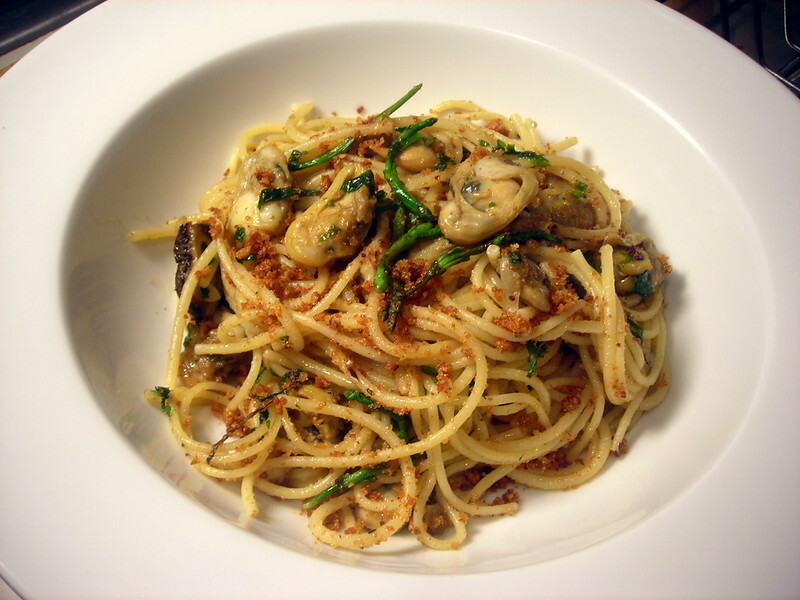 It’s filed under cooking, food, food photography, Presto Pasta Nights, recipe, spring and tagged clams, dinner, Italian-American food, samphire, spaghetti. Bookmark the permalink. Follow any comments here with the RSS feed for this post. As usual… stunning photos. And equally expected… a brilliant dish. Thanks for sharing with Presto Pasta Nights. Given that I live in Halifax Nova Scotia, right on the Atlantic Ocean, I’m hoping it won’t be a challenge to find the samphire. I understand from friends of mine who live in Texas that samphire can be foraged for, especially on sandy beaches like those that line the Gulf of Mexico near Galveston, for example. You may be able to get it for far cheaper than it sells for here in NYC. Eataly, which you may know as the brainchild of Mario Batali and Joseph Bastianich, was recently selling it for as much as $15 a pound. The expense is well worth it, however, the dish will be just as delicious if you didn’t use any. Your pasta dishes always look great; this take on one of my favorites is especially compelling. I must get out to the green markets ASAP! If you do try it, let me know how it turns out. BTW, you won’t find samphire at USGM, but at Eataly on 23rd Street and Broadway.